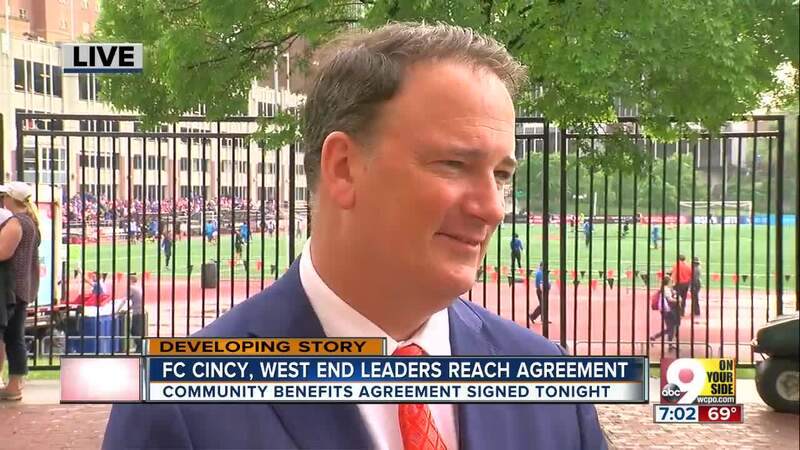 CINCINNATI -- The city council unanimously approved a community benefits agreement between FC Cincinnati and an ad-hoc group of West End residents after the two sides reached a deal following more than nine hours of negotiations Wednesday. Under the amended agreement, FC Cincinnati will pay up to $100,000 for a housing study for the Port of Greater Cincinnati Development Authority; pay up to $50,000 for a "communications consultant" for the Port, Seven Hills Neighborhood Houses and West End Community Council; and "support" the Port's efforts to invest in equitable housing development in the West End. The team will also help raise funds for housing support in the neighborhood and pay at least $100,000 each year for the West End Youth Soccer Program. FC Cincinnati will also hold two jobs fairs in the West End; commit to pay its full-time employees at least $15 per hour; provide community organizations including Cincinnati Public Schools with "priority for volunteer opportunities" at their future stadium; and hire union ticket takers and ushers, according to the agreement. The West End Community Council and other community stakeholders will have an opportunity to provide input on FCC Community Fund investments in the neighborhood. The fund's board will include two West End residents or other stakeholders. FC Cincinnati GM Jeff Berding said the agreement includes "substantial" investments beyond what was included in an earlier CBA. "We're going to be working together every single day in order to grow FC Cincinnati and in order to grow the neighborhood," Berding said. FC Cincinnati will support the Port's efforts to revitalize the Regal Theatre and encourage the city council to budget funds for a cultural arts center and other arts programs in the neighborhood. FC Cincinnati needed to close the agreement to earn $36 million worth of city infrastructure funding for the $200 million stadium site. The plans still hinge on Major League Soccer accepting FC Cincinnati's bid to join the league as an expansion team. Berding said he believes the agreement means they're "one big step closer to allowing that to happen." The stadium will be owned by the Greater Cincinnati Redevelopment Authority, according to Laura Brunner, the group's president. West End residents will get some input on the stadium's design via a Community Design Committee. FC Cincinnati agreed to meet with the nine-resident committee "as soon as possible" and hold at least two public meetings. Six members of the West End Community Council spent all day negotiating with the club in a City Hall conference room. Negotiations were expected to last until 1 p.m. Then officials estimated they'd be done by about 4 p.m. They didn't sign the deal until almost 5:30 p.m.
Kristen Myers, the attorney representing the West End group, said she believes the team "is committed to being a good partner" and that neighborhood residents "will hold them to that." "The community did not get everything that it wanted," Myers said. "And there's still a lot of work to be done for this community, but I think we have found a path forward for many of the issues." West End Community Council president Keith Blake had already signed off on a Community Benefits Agreement with the team, but other members of the council claimed he hadn't consulted with them before doing so and called for his impeachment soon after. The neighborhood, next to Downtown and Over-the-Rhine, is majority-black and traditionally low-income. Many residents agree new investment is necessary, but other residents and some black city leaders have repeatedly voiced suspicions that welcoming such a large, expensive project into their neighborhood could have a devastating effect on the people who already live there. The West End has a history of bad development deals -- Interstate 75 cut through the neighborhood more than 60 years ago -- and broken development promises before. Earlier this year, Cincinnati City Council approved a $36 million funding package to help build roads, construct utility lines and add parking for the soccer team's West End site. Hamilton County Commissioners have also pledged $15 million to build a parking garage. Still, Major League Soccer has not awarded an invitation to join the league. 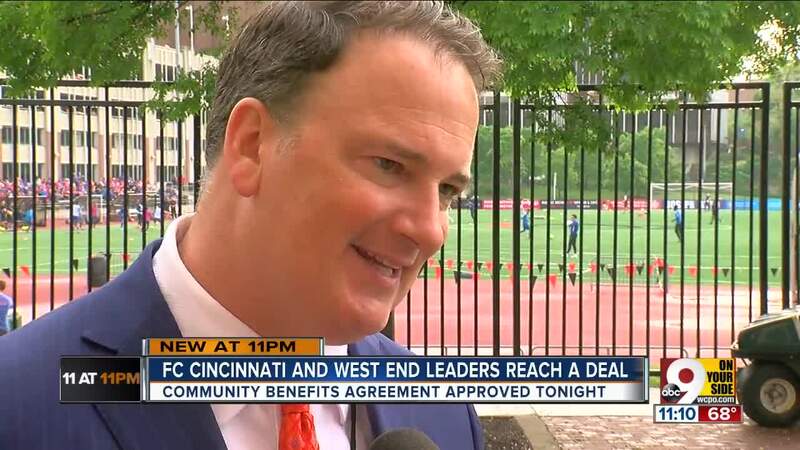 FC Cincinnati leaders say they need several more agreements -- including the community benefits agreement with the West End -- finalized before they get the nod from the league.